Ooppp, I send the first pic double! I meant another one! Please send me the other one, and I can replace it. However, I love that shot of the coral reef and like seeing it again. Yes, Garce, THOSE are toilets! We all must laugh when we saw it, couldn´t we imagine it what the diving teacher told us before about SANITAIRE articles! I wasn't sure what that stuff was. It sorta looked like links in a chain. Do you have any more information about that wreck? The most piccies I took I must cancel because of this unclear pics and I there for I´ve made about 1000!!!! photos! All those sights look so photogenic. What a fabulous trip! OKAY, I will do my duty! It was the Jolanda, the name of the ship! It sank in 1981 while a storm, I think. I found a good article about it, it´s better to read that than mine describing! It's about that national park zone we had our boat trip to! I also found a similar card about the wreck, it shows where the toilets lay. They told us a storm a few years ago took the fornt of the wreck deeper, so the toilets are only to watch! UUpss, the urls are so long! SORRY! 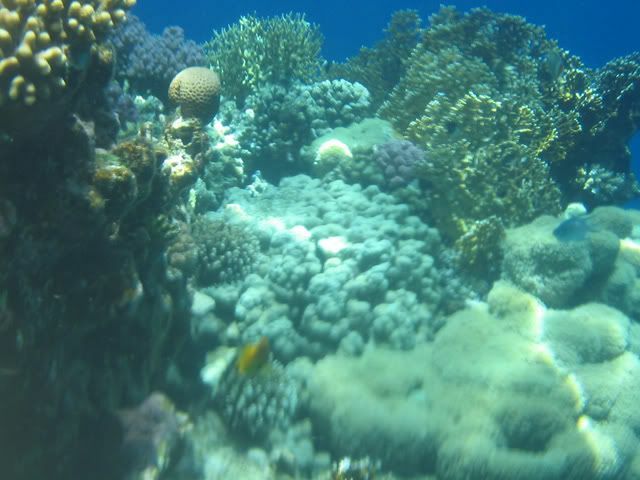 Here's Akka's other picture of the coral reef. colours of the reef are awesome! I love these gorgeous photos! Yes, I can´t stop watch these, too, although I was there! Estelle, have you read the articles about the Jolanda wreck? And at the boat trip I used a one way underwater camera, that´s why it took so long for developing here! To hanlde the camera in the Aquapack was not easy; everytime I saw clean through the..searcher? Oh yes! I've used one of those bags before, but not underwater - just in splashy boats and heavy rain. Oh Akka--how beautiful!! What breathtaking pictures! Mind if I take a little mini-vacation through your pics?? That just looks like heaven on earth--what an enchanting place. Thanks for sharing them with us, you little snorkling Egyptian goddess! Teri take as much snorkling breath as you can! Indeed the underwater world seems to be more coloured than the deserts!